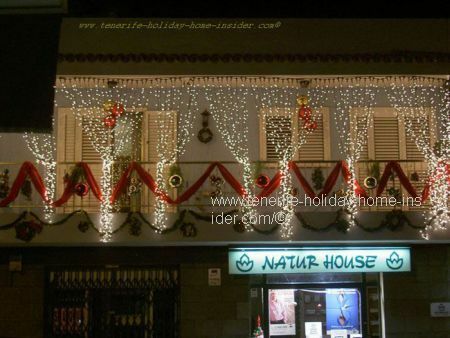 Photo with Christmas lights to remember romantic holidays Tenerife with basic tips for digital night photography. of diamonds, in real life, was not shown before. It was not relevant to do so with the sequence of pictures of photo of the day context. Digital night pictures of festive lights which are good enough to capture magic holiday moments may be done without special photo tricks. But some photo settings are extremely important. especially, with artificial, moving lights which represent falling Christmas stars. Always shoot one photo with flash and one without to be able to compare results. I was lucky and could rest my camera on a high window sill of a shop facing the balcony. When the Christmas illuminations looked straight and clear enough in my monitor I took the shot with flash. The Christmas mood conveyed by this digital night photography is well shown for the festive atmosphere created by this architectural lighting of a normal building in a main street. It's known that Tenerife climate is more than just its fortunate weather as the festive lights show. The welcoming Tinerfeños use special illumination for a more cozy winter and Christmas season. As I shared my photo of the day I will gladly include this one, as it shows a different mood. Lights to celebrate the birth of Christ in San Christóbal de La Laguna are not so abundant in its old, historical quarters as if not to spoil their serendipidity for Tenerife holidays with romantic flair which means less is more. back to photo of the day to see decorations and descriptions without its illumination as well as the miracle mirror image which is the most special picture of the day Christmas Eve picture story.